The Zoom Rooms controller lets you choose the video layout that displays on Zoom Rooms screens. In Zoom Rooms with one screen, tap the Change View icon on the iPad controller to switch among the Speaker, Thumbnail, and Gallery views. 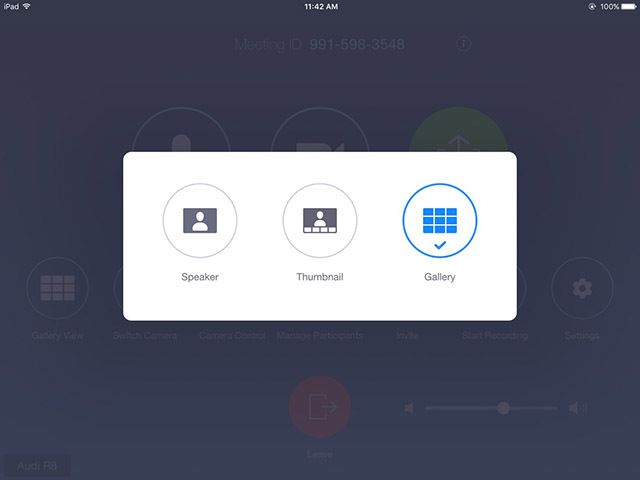 In Zoom Rooms with multiple screens, toggle the icon to switch between Speaker and Gallery views. Speaker displays a large view of the person currently speaking, with a smaller thumbnail of the previous speaker as a picture-within-picture. During screen sharing, the shared screen is in the large display and the thumbnail shows the person who is sharing. This view includes an Advanced option, where you can choose the size and location of the thumbnail, or choose to display the active speaker or shared screen without a thumbnail. Thumbnail combines the Speaker view with a scaled down version of the Gallery view. A small strip of thumbnails, showing up to 8 participants, displays beneath a relatively larger view of the active speaker. The thumbnails show the participants who were most recently the active speakers. This view is only available in Zoom Rooms that have a single screen. Gallery displays up to 25 participants on each screen, with the active speaker highlighted. For meetings with more than 25 participants, an arrow displays next to the icon. Tap the right arrow to display the next group of participants on the screen, and tap the left arrow to display the previous set. This view is not available in a Zoom Room with one screen when screen sharing is active. The procedure for choosing a layout for a Zoom Room depends on how many screens the room contains. Tap the Change View control. A popup shows the options for the display. Tap the icon with the view you want to display. In this example, if you tap Speaker, the Speaker View displays. To change the location of the thumbnail in Speaker View or during content sharing, tap Advanced. The Advanced Setting popup displays. By default, the thumbnail displays in the top right corner. To move the thumbnail to a different location, tap the corner in which you want it to display. To increase the size of the thumbnail, tap 2x. To remove the thumbnail, tap Off. In Zoom Rooms with two or three screens, the display settings for the each screen are customized by the Zoom Rooms administrator. What you see on each screen depends on the number of participants and whether anyone is sharing a screen. Note that Thumbnail view is not available in rooms with multiple screens. If a screen is configured to show either Gallery view or Speaker view, you can toggle between these views while the meeting is in progress. The icon shows the name of the view that you will switch to. See Customizing Display for Video and Content for information about how a Zoom Rooms administrator can customize the display on each screen.